The EOFY is typically a hectic time of year for most SMBs and advisors in Australia. Whilst most businesses are looking to ensure that any critical business purchases are made before 30th June and the books are in order, we’ve been working behind the scenes to ensure that QuickBooks Online and QuickBooks Online Accountant make your EOFY seriously easy. Click here to take a look at our new features webinar. 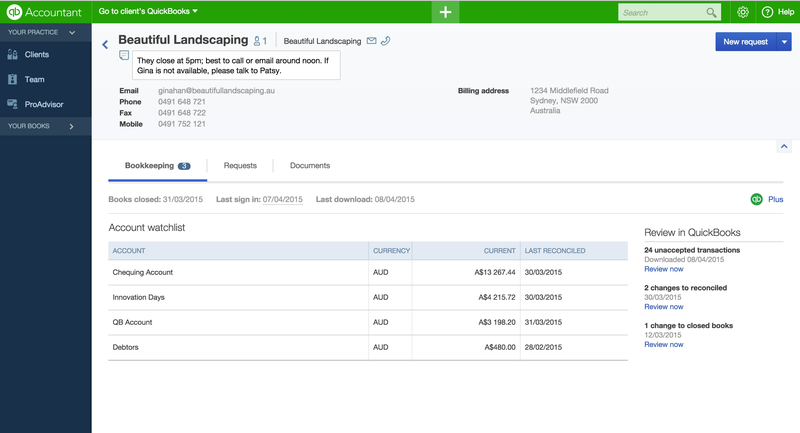 Invoice Template Customisation: You can now easily customise your invoice templates and import your own invoice design by importing a Microsoft Word .docx file directly into QuickBooks Online. Add invoice numbers to the email subject title: You can now add invoice, sales receipt, credit memo, and estimate IDs to email subject lines. To do this go to Gear > Company Settings > Sales > Messages > Estimate/Credit Memo/Sales Receipt > Use standard message. Note the variable [No.] in the Subject field. Client Dashboard: Review the status of all your clients whether or not they use QuickBooks Online (or Microsoft Excel) & track which clients need attention. Easily access any QuickBooks Online client’s books with one click. Document Management: Now you can request, share and store documents, along with the emails, chats and comments related to them, online all in one place. Your Document Centre is powered by Box, the provider of content storage and collaboration for 99% of the Fortune 500. 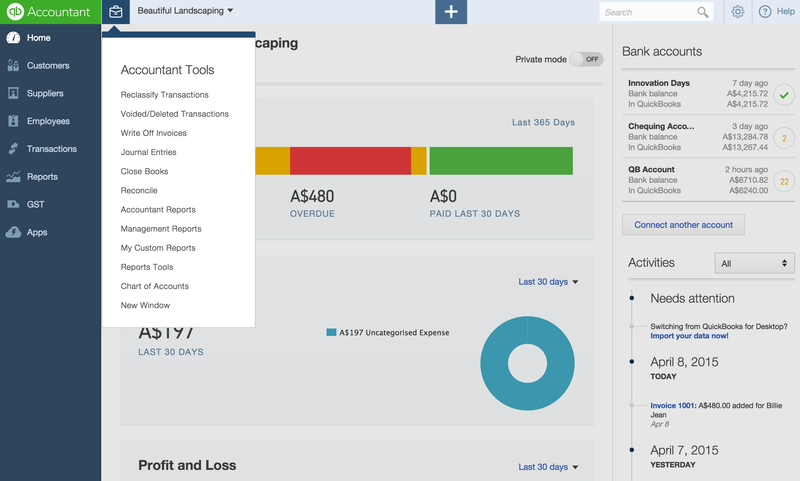 Bookkeeping insights: See all of your client’s accounts in one view and get important insights into their file like when they were last reconciled and which accounts need immediate attention. This helps advisors proactively manage their client’s books and provide real time advice when SMBs need help the most. Accountant tools: We’ve put your most essential tools that advisors use every day to support clients in a consistent place, no matter whose books you’re working on. We’ve made significant improvements to navigation so you can easily open multiple windows or tabs and open up another client’s books and easily switch between clients without needing to go back to the dashboard. User management: User management and team security is now seriously easy. You can choose to restrict which team members have access to specific client files and what level of security team members should have and easily make adjustments as your business needs change. 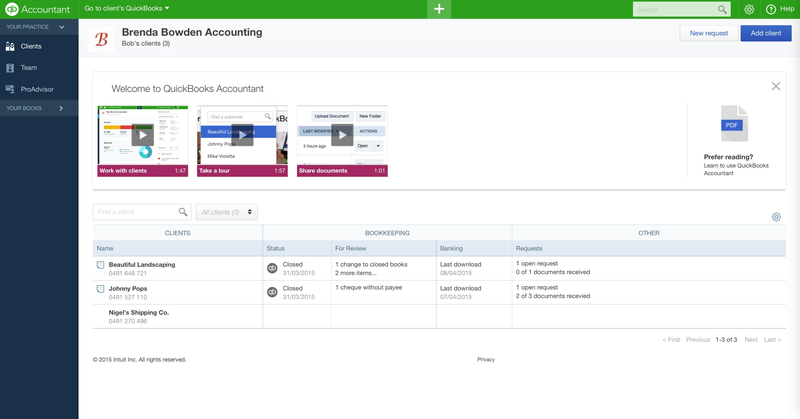 Your Company Books: QuickBooks Online Accountant comes with a free subscription to QuickBooks Online Plus with Payroll that you can use to manage your practice’s books. New customers and suppliers are automatically added to your Company books allowing advisors to run their business more effectively.